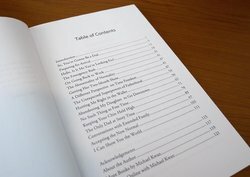 The table of contents (TOC) is the roadmap to each portion of your writing. Whether you're writing a large essay or a potential bestseller, the table of contents will allow readers to locate specific information or revisit their favorite parts within the text. Depending on the nature of your writing, there are a few different formatting options for you to explore. Let's examine various table of contents examples. When might you be required to formulate a table of contents? The first is a formal essay for school, depending on the length of the work. For example, if you're writing an in-depth, multi-page essay or a master's thesis, a table of contents will add an air of professionalism to your writing. On the other hand, if this is a short, five-paragraph essay on the history of the Galapagos Islands, a table of contents will not be necessary. Perhaps, when you graduate, you'll move on to write textbooks or novels. There, too, you'll want to include a table of contents at the start of your work. Think about it. How many times have we flipped open our textbooks and searched the table of contents for pertinent material? Likewise, when reading a fiction or non-fiction work, a table of contents allows readers to jump around to the sections that interest them the most. If you're wondering how to write a table of contents, the first decision you have to make is a matter of depth. How detailed do you want (or need) to be? Will a broad chapter summation work? Or, will you want to offer various subsections, too? Let's begin in the broadest sense. Here, we have a single level table of contents for individual sections of the work, or individual chapters. You'll want to include a series of dots to make it easier for the reader's eye to note the corresponding page number. Of course, you can continue to include as many subheadings as you need. If you go in-depth into the various types of nouns, verbs, adjectives, and adverbs, then you can include each type as its own subheading. 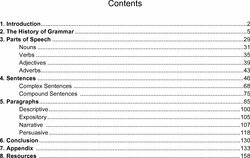 Let's look at a table of contents specific to academic writing. 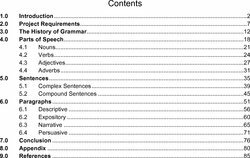 The above contents can work for academic writing or novel writing. Often, in academic writing, each heading is numbered and labeled. Of course, you'll want to check for samples based upon your instructor's preferred style of writing, like AP Style, MLA, or Chicago Manual of Style. A great table of contents comes in many shapes and sizes. While it depends on the length of the work (and the style guide you're bound to), there are a few common denominators to keep in mind. Here's a little checklist for you to run through when all is said and done. Use title case for each heading. That is, capitalize every word, excluding articles, preposition, or conjunctions. Include dots to allow the readers eye to scan from the section to the page number with ease. If this is an academic paper, number each section and subsection. Indent each subsection under its parent section. If this is an electronic submission, link the title of each section to the corresponding page within the work. Note that each section and subsection should align with the body of the essay. For example, in the body of the paper, if section 6.0 on "paragraphs" uses "Heading 2" in Microsoft Word and section 6.1 on "descriptive paragraphs" uses "Heading 3," you'll know to include subheadings in your table of contents. If this is a book or novel, you'll have to decide on clever titles for each of your chapters (or simply go by Chapter One, Chapter Two, and so forth). However, if this is an academic paper, your table of contents should only include actual sections and subsections from the work itself. Creating a table of contents is a matter of organization and precision. Remember, you worked hard to create an in-depth study on a certain topic. Allow readers to pinpoint certain components of your information with a flip of the page or a click of the mouse. For more on the mastery of academic writing, enjoy this in-depth study on the topic. "Table of Contents Examples." YourDictionary, n.d. Web. 23 April 2019. <https://examples.yourdictionary.com/reference/examples/table-of-content-examples.html>. The table of contents (TOC) is the roadmap to each portion of your writing. Whether you’re writing a large essay or a potential bestseller, the table of contents will allow readers to locate specific information or revisit their favorite parts within the text. Depending on the nature of your writing, there are a few different formatting options for you to explore. Let’s examine various table of contents examples.